Than Wai Aung adjusts the nozzle on his hose to a fine spray, and walks slowly up and down a long row made up of hundreds of clear, plastic bags filled with wood. This is a daily ritual for the Burmese migrant, who left Yangon (also known as Rangoon) for Thailand nearly 20 years ago. 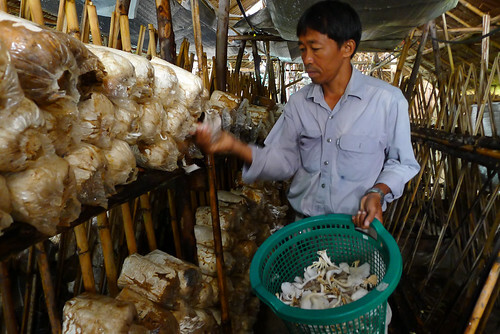 The moistened wood contains the spores of oyster mushrooms, and every two or three days Than is able to collect several kilos of fungi to sell, either to market traders or often directly to Burmese labourers working on nearby building sites. Than’s move to Thailand started in much the same way as other Burmese migrants. He settled first near Ratchaburi, a town in western Thailand, not far from the border. On the building sites Than earned between 200 and 300 baht (£3.80-£5.75; $6-$9) a day. At first, though, his business did not go well. There was no-one to teach him how to cultivate the mushrooms and he had to learn through trial and error. He let too much water get inside the bags of wood, so it rotted and the fungi would not grow. Even when he did get a good crop, the price he could get in Ratchaburi, a poor provincial town, was very low. But he refused to give up. Instead, he decided to move to Bangkok. As Thailand’s economy has grown, and its per capita income has risen well into middle-income territory, it has drawn in millions of migrants from poorer neighbours such as Myanmar (also known as Burma), Cambodia, Laos and Vietnam. They do the badly paid, menial jobs that Thais no longer want to do – construction, domestic work, agriculture and fishing. It is estimated that migrants make up around 10-15% of the workforce in Thailand, yet successive Thai governments have failed to provide them with proper legal status or protection. Some industries have been accused of systematic abuses of their mainly Burmese workforce. The fishing industry, in particular, has been charged with horrific abuses, resulting this year in the United States relegating Thailand to the lowest rank in its annual report on human trafficking. Thai and Burmese officials have also been accused of extorting large amounts of money from Burmese migrants in return for giving them documents they are entitled to. As a result, success stories like Than Wai Aung’s are very rare. But when you listen to him talking excitedly about his ambitions, you sense the drive and determination that have brought him this far. 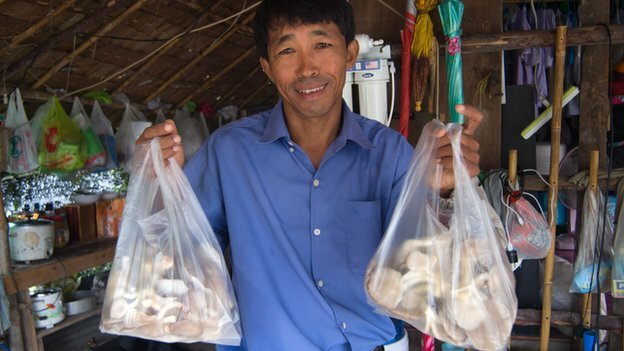 He has built his own mushroom sheds out of palm thatch on narrow strips of land between fish ponds, in an unglamorous wasteland on the outskirts of the Thai capital. He moves back down his rows of wood, carefully pulling out the fully grown mushrooms, and cleaning out where they had been rooted with a spoon. He clips the base of the stalks, weighs them, and then mounts his motorbike for a delivery to a nearby housing estate, which is under construction. As anywhere else in Thailand, the workers – his customers – are also Burmese. “I want to be rich – rich enough to buy a car. To do that you have to be bold – you cannot be afraid of going broke,” says Than. Than is also selling the wood packages to people who, like him, want to try their hand at growing mushrooms. He can make even more money that way – and is not worried about encouraging competition.